After a long and courageous struggle with illness, and a short stay in Burnley General Hospital, Terry, aged 83, passed away peacefully on Thursday 10th January, fortified by the Rites of the Holy Mother Church. Terry was a well known and loved member of the Raphael family having served the pilgrimage for many years as a faithful brancardier. He was also a long serving member of the Hospitalite NDL carrying out his annual Stage weeks welcoming pilgrims to Lourdes at both the train station and airport. Please also remember Kath his wife, and his extended family in your thoughts and prayers. Many of you will know Kath as one of our Trustees, and formerly Chief Handmaid and organiser of the the northern group. Kath is also a Hospitalite NDL member and for many years has served in Lourdes on Stage with Terry. 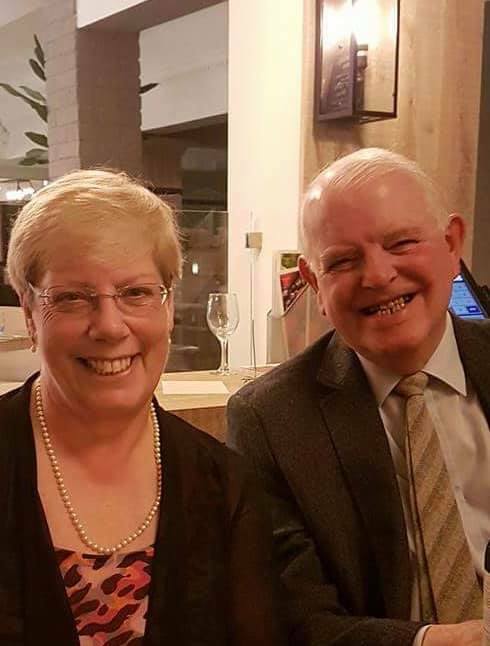 At peace and reposing in the Chapel of Rest, Mincing Lane, a Requiem Mass and Terry’s love of Lourdes will be celebrated at St John Vianney's RC Church Blackburn on Monday January 21st at 11.00am prior to interment at St Mary's RC Church Osbaldeston. We are very sad to have received news of the death of Pamela Thompson (wife of the the late Gilbert Thompson, former Director of the Pilgrimage who founded it at Leonard Cheshire's request). "Dear Raphael team, I wonder if there are people there who remember my mother Pamela Thompson who for years helped my father Gilbert Thompson with organising the yearly pilgrimage. As well as running the fund in his memory. I have sad news that she died this last Sunday 5 August after a long struggle, borne with patience and sweetness. She was a wonderful mother and devout member of the Reading church of St Anne's, Caversham,, working tirelessly in many charitable ways. If anyone would like to be in contact with me, or even to attend the funeral at 10am on Friday 24th August at St Anne's, they would be most welcome. My brother Damian and I wish Raphael and all who work so hard to enable the veneration of Our Lady of Lourdes every success in the future. God bless, Carmel Thompson"
May Pamela rest in peace, Amen. We were extremely sad to share the news that Rita Lowe passed away on 13th July 2018. Rita died peacefully at home and will be greatly missed by the Raphael family. Rita was looking forward to her annual pilgrimage with Raphael this year. Please remember her and especially her family at this sad time. Eternal rest grant unto her Lord and let perpetual light shine upon her. May she rest in peace. Amen. Rita received an excellent send off yesterday. The Requiem Mass was concelebrated by three priests with Mgr John Dale presiding. The other two priests were introduced but I did not catch their names. There were about 150 mourners in the church and a very impressive music group with four guitar players, one person playing a keyboard and another trumpet. Raphael was represented By Kevin Heakin, Trevor McKean, Jane Hindle, Joyce and Mandy Southall, Gerald Buckle and myself. Mgr Dale gave an excellent homily interspersing anecdotes about Rita with insights into the chosen readings. Rita’s daughter, Catherine, delivered a moving homily in which she stressed how important her faith was to her mother and what an influence Lourdes had been on her life. Indeed, we were told Rita’s case was already packed in preparation for the pilgrimage in September. Catherine included a contribution from Fr Leo who was unable to attend because of a clash of engagements. Rita’s was a life well lived and we were given outlines of her many interests which, in later life, were dominated by her grandchildren. Rita’s life was dominated by the three ‘F’s: faith, family and friends and her second home was the church. Eternal rest grant unto her O Lord and let perpetual light shine upon her and may she rest in peace.